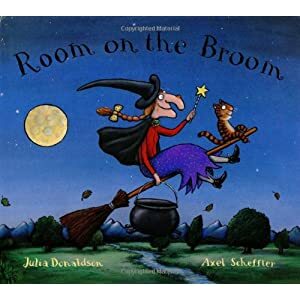 The Room on the Broom movie and children’s book by author Julia Donaldson is a perfect treat for Halloween fun. Read the book together, then share some popcorn while you enjoy the this splendid story of friendship with your preschooler! The charming story of a kind-hearted witch who welcomes a group of misfit animals on her broom, much to the dismay of her pet cat. When the new group companions join forces to save the witch from a hungry dragon, she conjures up a magnificent new broom, with a little something special for each of her new friends! This beautifully animated film is based on the best-selling children’s picture book written by Julia Donaldson and illustrated by Axel Scheffler was an Academy Award Nominee 2014 and Parents’ Choice Award Gold Winner 2013. The Room on the Broom movie is a magical tale of friendship directed by Max Lang & Jan Lachauer, and featuring the voices of Gillian Anderson, Rob Brydon, Martin Clunes, Simon Pegg, Sally Hawkins, Timothy Spall and David Williams.